Valves at the higher end of the size range are linear-clavate with undulate margins, while smaller valves are clavate with smooth margins. The headpole is narrowly rounded to nearly acute and the footpole is narrowly rounded. The axial area is lanceolate, narrow at the poles, and expanded towards the center. Stigmata are absent. The raphe is straight, filiform, and the external proximal raphe ends are dilated. The central nodule is distinct and round. The striae are formed by a single areola, with an additional 1-2 isolated areolae towards the axial area. The striae are radiate, becoming parallel near the footpoles. Septa and pseudosepta are absent. In 1878, Grunow published a new species, Gomphonema brasiliense, based on material collected from Brazil, Cuba and India. No holotype was designated, nor did his description include an illustration. In 1880, Van Heurck published two line drawings in his Atlas, labeled “G. (abbreviatum) var. brasiliense”, from Brazil and Cuba (T. 25, Fig. 17a-b). In 1985, Krammer and Lange-Bertalot proposed that the three syntype populations for G. brasiliense were not conspecific and lectotypified specimens from the Brazilian material, which was the first collection mentioned (and therefore had priority) in Grunow 1878. They published light micrographs of the lectotype population that strongly differ from Van Heurck’s line drawing. Krammer and Lange-Bertalot state that Van Heurck’s drawings derive from the Cuba population, which they considered G. grovei var. lingulatum. Gomphonema brasiliense and Gomphosphenia lingulatiformis taxon pages were opened in September 2011, documenting what appeared to be the same taxon under two different names. These two names for one taxon are incorrect, and the problem needs to be rectified. The taxon G. brasiliense has not been confirmed in North America. Specimens illustrated by Patrick and Reimer (1975) and Wallace (1960), identified as G. brasilisense, were both revisited and were determined to conform to G. lingulatiformis. Furthermore, NAWQA and NRSA samples collected in rivers in the southeast U.S. with count records for G. brasiliense were reexamined in December 2016. For all reexamined slides, the relevant gomphonemoid diatom population on the slide was morphologically dissimilar to G. brasiliense sensu KLB (lectotype from Brazil). In contrast, these valves bear resemblance to the Van Heurck Atlas line drawing (T. 25, Fig. 17a-b), and more specifically like Gomphosphenia lingulatiformis (Lange-Bertalot and Reichardt) Lange-Bertalot 1995, a taxon described from France. We suggest that the Cuban syntype population of G. brasiliense is either G. lingulatiformis or a morphologically similar Gomphosphenia, and that this was the material upon which the Van Heurck line drawing is based. 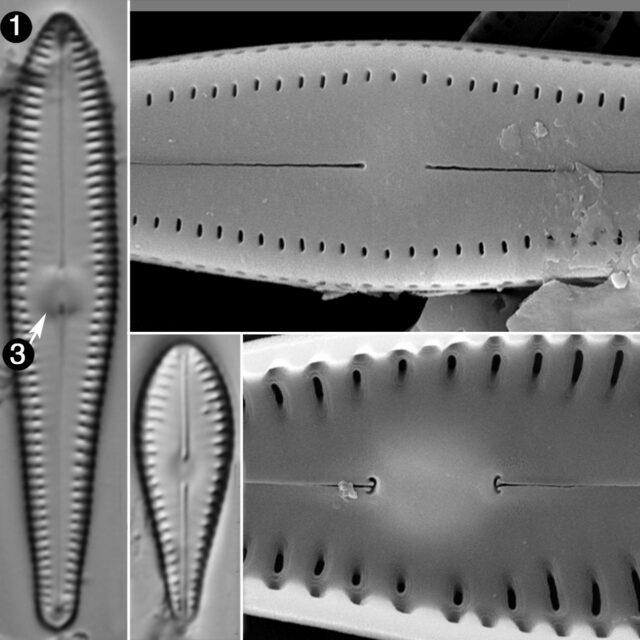 This diatom is relatively common throughout rivers of the southeast (USGS 2015 SESQA survey). In contrast, it was reported in only a few sites in western surveys (EPA 2000-2004 Western EMAP). Valves are linear-clavate to clavate. The headpole is narrowly rounded to nearly acute and the footpole is narrowly rounded. The axial area is lanceolate. Stigmata are absent. The central nodule is distinct and round. Striae are formed by a single areola. Striae are radiate, becoming parallel near the footpole.